In the part of the country where I grew up, pumpkin isn’t a traditional ingredient. I don’t think my grandmother ever prepared it in her entire life. So when I came in Italy I discovered this delicious fruit (till then I was convinced it was a vegetable!) and tried numerous pumpkin recipes. 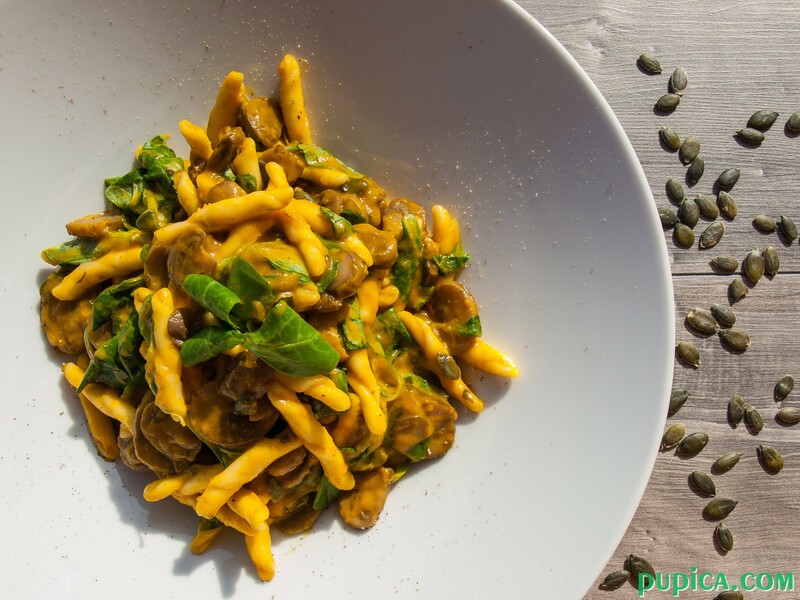 In Veneto region the pumpkin is a traditional ingredient, there are many festivals and events dedicated to the pumpkin in this time of the year. I love preparing different pumpkin dishes, but my favorite one is the classic pumpkin risotto and this recipe that I am writing about. I really love it! Pumpkin gives that super creamy flavor to the recipe that makes you want to eat it every day. In fact, in this time of the year I prepare different pumpkin recipes at least 3 times a week… Not to mention the pumpkin seeds, I use them in various recipes, especially when making the whole wheat bread in which I add so many different types of seeds. 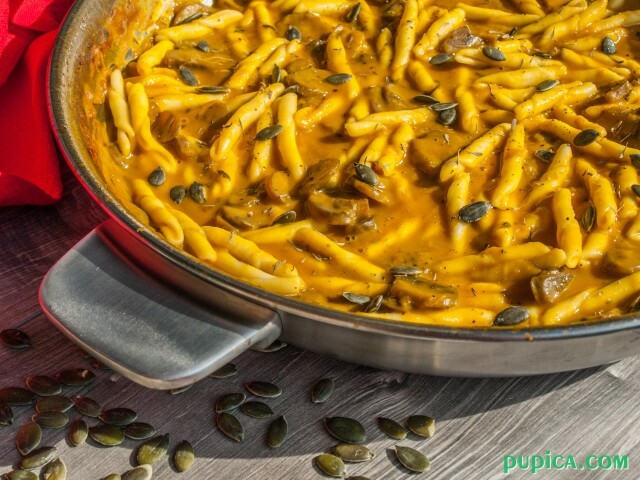 This is a light pasta dish with a delicious creamy pumpkin sauce. It is absolutely easy and relatively quick recipe. I often prepare pasta with a simple pumpkin creamy sauce for my son, because the pumpkin is one of the most nutritious fruits out there and it has a sweet flavor, so you can imagine why he likes it. Pumpkins are super healthy, very easy to prepare and the most important thing, they are highly versatile, so you can incorporate them in so many recipes and with so many different ingredients. So give it a try with this recipe, it won’t be difficult and let us know how it goes. Share with us what is your favorite pumpkin recipe in the comments section below. 1In a skillet warm the oil and add finely chopped onion, cook until golden. 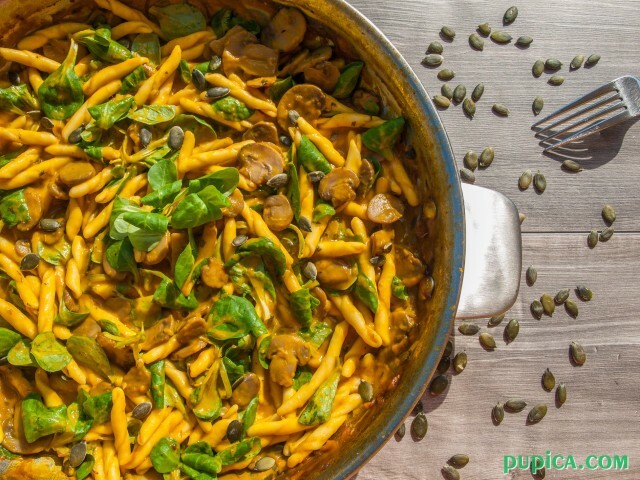 2Add peeled and diced pumpkin and washed, sliced mushrooms. Cook on medium heat until the pumpkin becomes mushy. Add water if necessary. 3When the sauce is ready, bring a large pot of salted water to the boil and cook the pasta as indicated on the package. 4Drain the pasta and add it to the sauce. Add parmesan cheese, valerian salad and toss well to coat. You can add 1 tsp od dried thyme for a more intense flavor.